While I try to stay focussed on the goals I set in my summer hit list, I can't help but feel distracted by a few project ideas that have been rolling around the old cranium cavity. 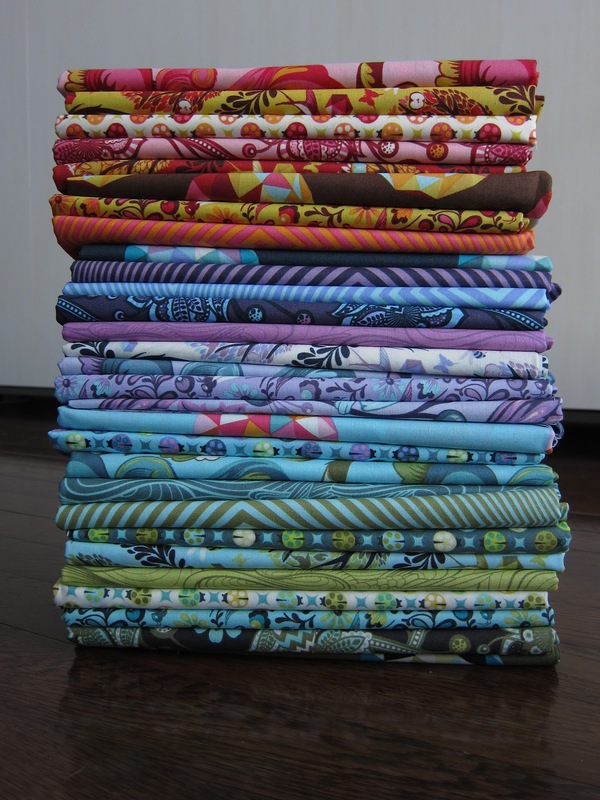 This thinking has since devolved into stacks and stacks of fabric being scattered around our living space (ie. condo) and is dangerously close to becoming a bad case of startitis. In the living room, you'll find this lovely little bundle. 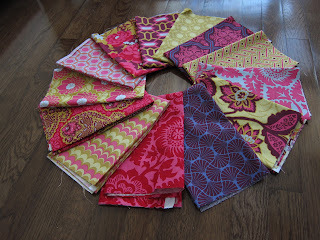 I bought this a few months ago from Pink Castle Fabrics with a coupon code with the intention of making a bowtie quilt using this tutorial by Katy over at Monkey Do. I had sort of forgotten about the project until I went to my grandparent's place in early August and spent hours snuggled under the bowtie quilt that Kelsey had made for my grandmother's 80th birthday. Since coming home, I have been fighting the urge to cut into them. My night stand is playing temporary home to a fat quarter set of Joel Dewberry's Heirloom collection (apparently I'm off on a bit of a yellow and magenta jag). I'm thinking it would do as a Rubik's Crush quilt for my childhood friend who after having two sweet little boys is now expecting her first little girl. She is over-the-moon excited to have another lady in the household that can balance out some of the testosterone. 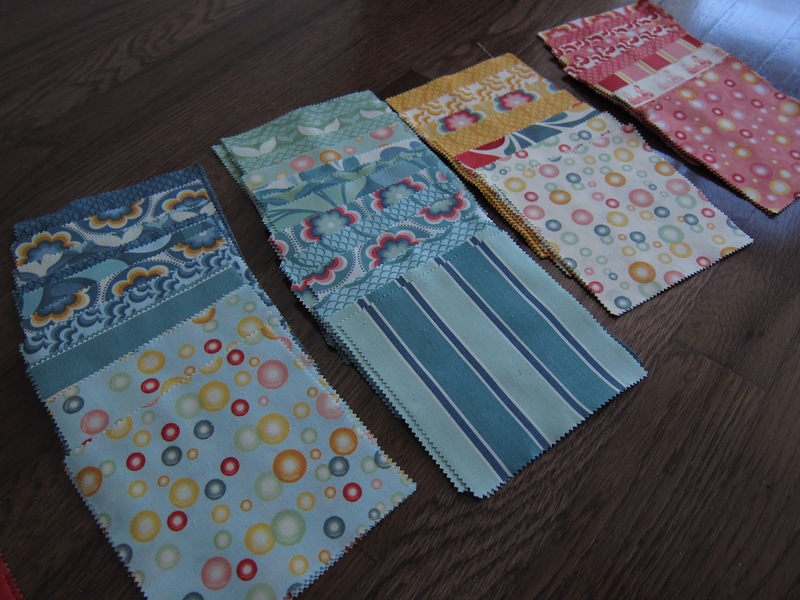 I really like that this is a larger quilt, and will be useful long after the baby starts walking. 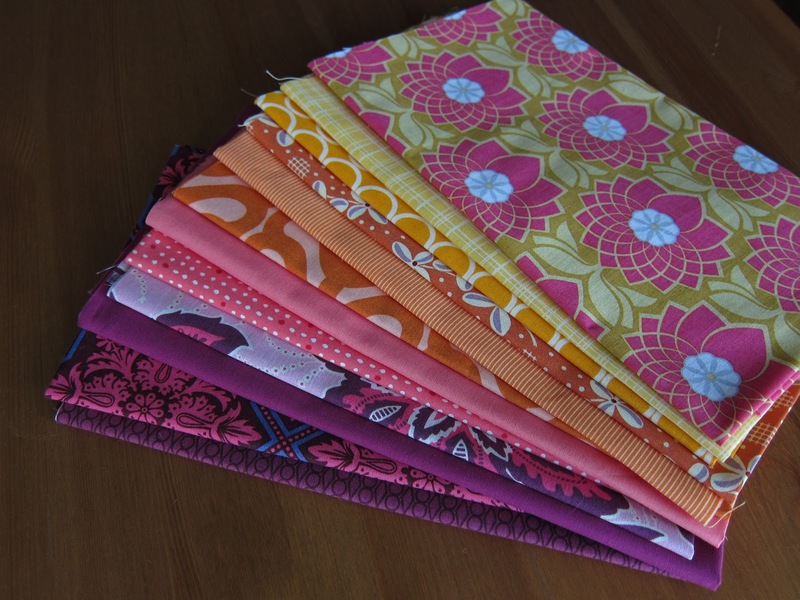 After seeing some gorgeous quilts being made with Tula Pink's Birds and Bees collection and after Kelsey's recent purchase (we're nothing if not competitive with each other), I stumbled upon a full yard bundle of every print in the collection. 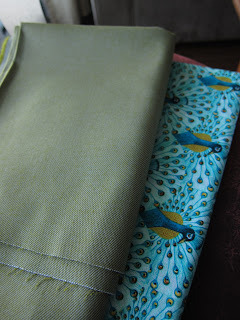 I snapped it up since it seemed like the only way to really ensure that I had enough of these gorgeous fabrics. This stack has taken up residence in the guest room. My husband recently started working in California. He's just part-time at this point and still spending most of his time in Toronto but starting in January, he'll be moving there and we'll be doing the long-distance marriage thing until I can join him sometime next summer. I figured that if I'm going to spend 11 hours a month on planes, I'd better have a cute handmade weekend bag to take along with me. I found this blue and green denim that I bought back when I thought I would attempt a pair of shorts for myself (haha!) and decided that it would lead a much happier life as a cute duffel bag. I'm still trying to decide what fabric I'll use for the lining so in the meantime, the denim is cosying up next to the stash in the den. Lastly I bought a some Salt Air charm packs a few months back planning to make Rachel Griffith's Smitten quilt. I bought enough fabric to make 20 blocks instead of the called-for 16. I love the weather beaten look of the colours used in this line and am anxious to start cutting into it. 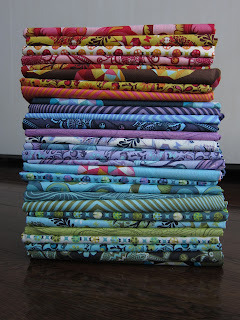 I couldn't help but to organise these fabrics by colour and print and put them in one of my WIP bins so they are ready to go as soon as I give myself the all clear. What do you think? Which of these would you start now after I make some more progress with Carnival? I would go with Smitten! I love that one.